Home > Seasonal & Special Occasions > Easter Gift Ideas > Chenille Bunny Nicole from Grandma's Heart 8"
Chenille Bunny Rabbit Nicole from Grandma's Heart 8"
This 8 inch Chenille Bunny named Nicole is from a company called Grandma's Heart. This plush rabbit was introduced in 1999. It is in mint condition. The arms and legs are attached and this lamb is floppy and posable. It is made from vintage style Chenille fabric so it looks like it was made from an old chenille bedspread. 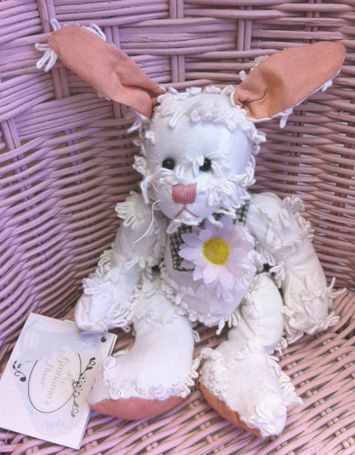 This Chenille Bunny Rabbit has gingham fabric around her neck and a soft pink daisy is attached at the end. She has embroidered nose and mouth and black bead eyes. for you to put on your bed. I hope you remember.